Whether or not Apple will, Epps believes the company should produce a smaller, cheaper iPad to capture market share from both Amazon and Barnes & Noble, which have addressed the lower end of the market with their touchscreen tablets. While Forrester's surveys have found that 62 percent of tablet shoppers prefer a 10-inch screen, 26 percent said they would like a smaller screen, and 20 percent are undecided. As for Android-based tablets beyond the Kindle Fire or Barnes & Noble Nook, which run customized versions of Google's mobile operating system, Epps believes vendors should abandon android and jump ship to Windows. She believes that those who expect Android to find success in the tablet market as it has done with smartphones are wrong. 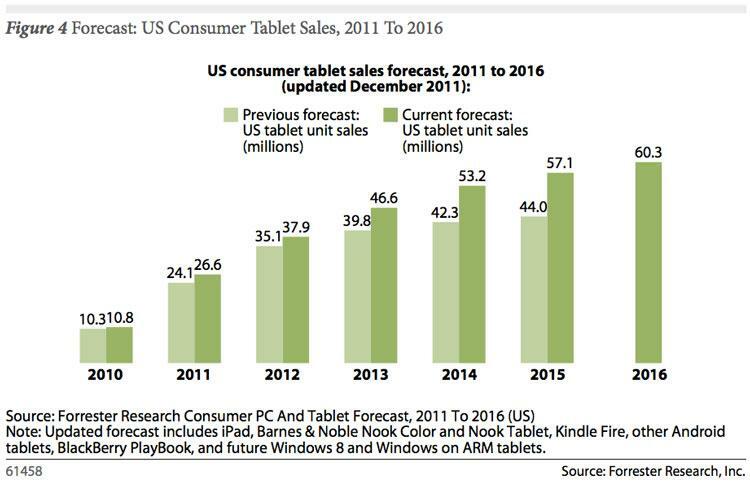 While Android tablets have grown thanks largely to Amazon and Barnes & Noble, Epps noted that Forrester's research has found most consumers say they would rather buy a Windows tablet than a one running Google Android. "We don't think it's a matter of time before HTC, Lenovo, or Samsung tablets start to sell  unless they're running Windows," she said. "Android OEMs would do best to dial down their investment in Android and shift investment to Windows to leverage Microsoft's still-strong consumer brand, enterprise acceptance, and global scale."